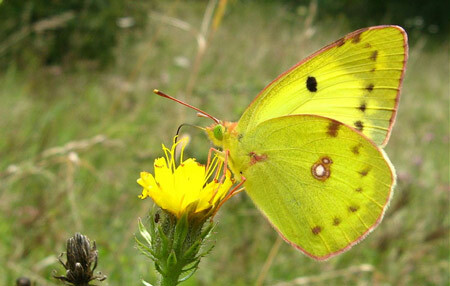 Special features: The clouded yellow is a migratory butterfly from Europe which usually settles in the southern counties. When winter comes the adults either die or migrate south. The undersides of the wings are a greenish yellow, while the upper surfaces are a vivid orange-yellow with a thick black border. 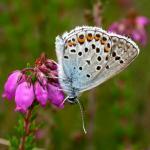 It is this dark border or 'cloud' which gives the butterfly its name. The upper surfaces of the wings also feature a black spot in the middle of each forewing and an orange spot in the middle of each hind wing. The border on the females wings has a row of pale yellow spots running round it. Distribution: Found mainly on the south coast of England and Wales. 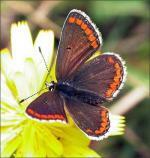 Habitat: Gardens, fields and meadows. Food: Nectar. The caterpillars feed on clover and bird's-foot trefoil.